Staynor Hall Community Primary Academy » Art Exhibition – Thursday 22nd June @ 2.30 p.m.
Art Exhibition – Thursday 22nd June @ 2.30 p.m.
After our recent sporting successes, it is now time to celebrate the Artistic talents of our amazing children. 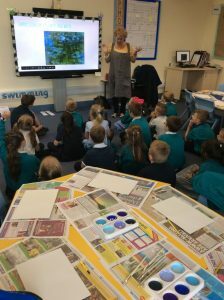 In recent weeks, we have benefitted from working alongside the Ebor Creative Arts Specialist, Louise Brooke, who has been inspiring artwork which will soon be entered into the Selby in Bloom annual children’s painting competition. The theme for the work is ‘Flowers painted by Impressionist Artists’. All children in Team Esk, Nidd, Aire, Ouse and Derwent have produced work for the competition. On Thursday 22nd June, we will be holding our first ever Art exhibition. This will provide an opportunity for you to come and have a look at the amazing work your children have been producing. After the exhibition, the work will then be submitted to the competition and we will wait to see if we have any prize winning artists!